Project: The Kitchen that Won’t Stop! 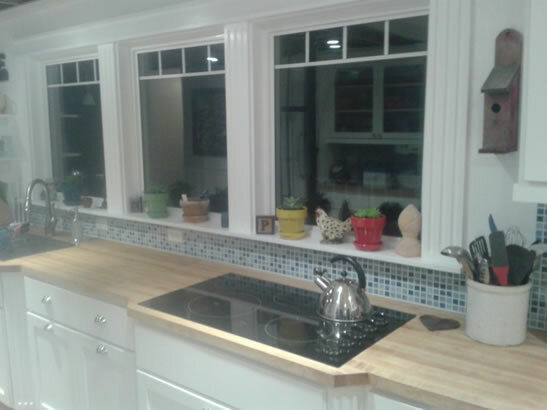 Home » Home Improvement Projects » Project: The Kitchen that Won’t Stop! Here is my personal kitchen project that has been under construction for well over a year. It is 90% done now with only part of the ceiling to be buttoned up after a bit up the upstairs plumbing is moved for the new master bath (another project- details to come later). Thanks to Justin at Western Idaho Cabinets for getting the cabinets built, Victor for installing them, and Tim at Johnson Brothers for getting me set up with the Butcher Block Counter Tops from Boos Blocks. 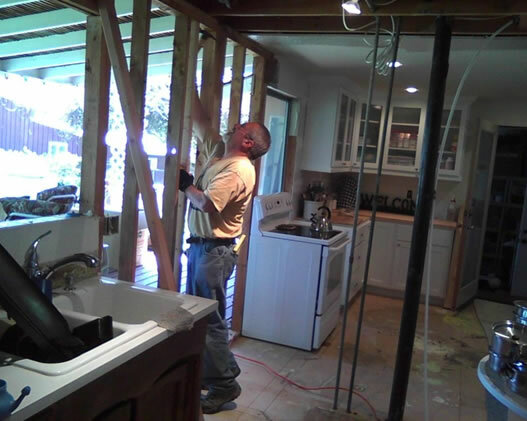 This is the “Before” with the divider wall between the old kitchen and the dining room just being removed. The window over the sink will go away; the two tall windows in the dining room will go too. In the middle will be three new windows. I pretty much braced up the second story and re-framed the full exterior wall. The following are the pictures as of 12-1-2012. You can see the tile floor is in, the backsplash tile is a denim shaded mosaic tile and the under-counter lights are all LED. There are eight can lights in the ceiling, all LED also. Here you can see part of the new cabinets installed. We actually broke the install up into three parts so we could have something usable as we moved along. Nampa Appliance supplied the cook top, refrigerator, and oven and microwave. The windows are from Western Window through Campbells Siding and Windows. We bumped out the sink and cook top area for a bit of texture to break up the long run (over 19’ long!). Western Idaho Cabinets made the casing for the windows that also matches the set up I did in the front living room. Small detail that really makes a difference. The Sink is a Kohler item from Fergusons. It is supposed to be used in an under-mount configuration in granite, but we just dropped it in. The edge was finished so nice, it worked out perfect. Huge single bowl with a drain shelf. It also came with its own cutting board, 6 veggie bowls, and two prep trays and the wire racks. It was very different for us, but we have come to really like it. We do not have a dishwasher. Never have. We do all dishes by hand and dry them and put them away. Partly because we have a septic system, and mainly because the Kids years ago would never empty the dishwasher. Once it broke, we never replaced it- and just got used to it! It provided some family time an life lessons. I built the plate rack for our Fiestaware out of the cut offs from the counter top. Open shelving above is for the other dishes and glasses. The sink and cook top cut outs made some killer huge cutting boards! This wall is opposite the windows and is the “big Stuff” in the kitchen. Note the big drawers. We over did it here by going over 4 foot wide. Next time, they should be a little smaller. All the upper cabinets over counter tops are glass doors. The picture you see at the end of the wall is a sheet of galvanized metal framed with some scrap molding I had. It has all the family photos and stuff that used to be on the fridge. Magnets hold it all on. The counter tops require oiling about every month, but the warmth and feel of them is very much worth the care and maintenance. Once I get the bathroom up stairs roughed in and tested, we can sheetrock the ceiling and end the project in this part of the house. Good, we are ready to be done here!